Who Else Wants To Increase Their Songwriting Powers By 10 Times? I want to share an idea that can literally multiply your songwriting powers by 10X. And that’s not just a made up number either. In a moment I’m going to share with you exactly why I say this very specific number. Well, whether it has or not, there’s an important lesson in this. And that lesson is, when you have an idea and ACKNOWLEDGE it by taking ACTION on it, it makes way for a stream of associated ideas. In fact, for every 1 idea that you take action on, you will generate at least 10 associated ideas. The key is in acknowledging the very first idea… because if you don’t the other following ideas will never be born. But if you DO acknowledge an idea, and then watch carefully for related ideas to be born, your creative powers will increase exponentially. Why Will Your Creative Powers Increase So Dramatically? Firstly, while you’re playing with the first idea, related ideas WILL be born. As I mentioned earlier, it’s easily possible to create at least 10 related ideas. And when these NEW ideas surface, they also bring with them many more related ideas. 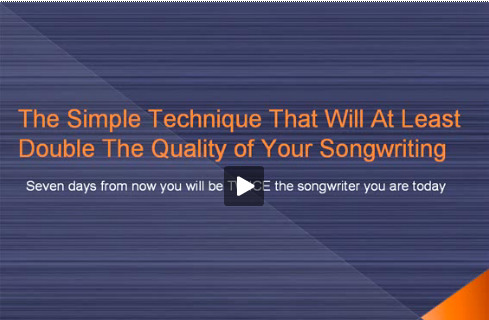 This is a rock solid concept that you can use in your songwriting. What I’m talking about is the idea of creative momentum. Writers block doesn’t occur because of a lack of ideas. It occurs because for some reason or another, the person has decided to stop acting on the ideas, or hunches that occur to them when they’re writing. If you build creative momentum, ideas will always flow abundantly. Your brain is so powerful, and the thing it’s absolutely brilliant at doing is creating ideas to support something you’re trying to accomplish. This astonishing power your mind can be tough to see at times. One of the biggest reasons is because most of the creating it does happens at an unconscious level. This means that the processing or “creating” is going on outside of your awareness. It’s only after an idea has been completed when it suddenly “pops” into your awareness for you to take action on it. When you sit down to write a song, whether it be writing music or lyrics, here’s what typically happens. By sitting down to write, you’re sending a signal to your brain that’s basically saying, “I want to create ideas for a song”. Your unconscious mind acts on this, and will go to work, creating ideas for this song. As you fiddle around on your instrument, or write a few words of lyrics, you’ll notice very subtle signals inside your mind. These signals will be ideas for what you’re trying to accomplish in this session. Now, because the signals are very subtle, they can be a little hard to make out. This is why most musicians dismiss these ideas and complain that they have writers block. Instead of dismissing these ideas though, you must embrace them. You must try and tune into them, subtle and vague as they may be. Do your best to acknowledge the idea. Attempt to bring it into the world on your instrument or through your lyrics. When you do this and acknowledge these subtle ideas that occur to you, all of a sudden you’ll feel amazed as more ideas will begin occurring to you. This initial idea, even if it wasn’t your best, breeds new ideas. Each new idea, as you play with it, evolves with little effort at all. And as this happens, the quality of your ideas are sent on an upward spiral. When you first began, the initial ideas may not have been incredibly compelling. But now that you’ve created this creative momentum, you’ve struck a rich vein of ideas of amazing quality! Also, while the first ideas at the beginning of the session were very subtle and hard to notice, you’ve now “tuned into” the signals your unconscious mind are sending you. And because of this you notice the new ideas that arise very clearly, in stunning detail. Boy, this is an exhilarating ride! Your Job? Get The Ball Rolling! Now, at this point you’re probably realizing that songwriting can be a fun, joyous process. And you’d be right! There’s only one tough little patch you need to get through. And this is at the beginning of each creative session. When you sit down to write some music or lyrics, the first 5-10 minutes can be tough. This is where you’re not completely “tuned into” the signals coming from your unconscious, so it feels like no ideas are coming out. In this tough little period you MUST keep plodding away, and maintaining awareness for those first, subtle ideas. And when you notice something, ANYTHING, you must “jump on it” as fast as you can. When you do this you will easily begin to build creative momentum, and sooner or later you’ll notice your mind creating a large flow of mesmerizing musical ideas – more than you can keep up with! There’s Much More As Well! While I’ve just given you a secret that can absolutely increase your songwriting powers by 10 times, there’s much more where that came from! The ideas in this article came out of many years of research I conducted into the creativity process, as well as looking deeply into many studies of human genius. Out of this research I discovered that literally anyone can take their songwriting abilities to spectacular heights, using a few very specific principles and techniques. I’ve compiled these techniques, ideas, and principles into a songwriting course that’s available online through this website. It’s hands down the most effective course on the topic of songwriting, because it uses the same strategies and techniques that the “musical geniuses” of the world use to write their masterpieces. If you want to release your full, amazing potential as a songwriter, be sure to visit the blue link above and check out the details. You will also find many stories from the musicians who have already taken the course, discussing their amazing breakthroughs.